"An Inordinate Number of Gondolas"
After our usual cappuccino at Gino's, we set out for the Lido on a sunny and gorgeous day. 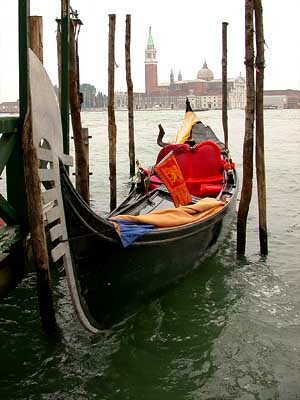 As our vaporetto moved through the Grand Canal we noticed an inordinate number of gondolas. Don't usually see so many this early in the morning. Ah, the Lido. I've heard about it, seen it in Thomas Mann's Death in Venice, but have never seen it. A long skinny island with a couple of grand hotels and great beaches. It was "discovered" by Byron, Shelley, and other romantic writers in the late 19th century; and became a fashionable resort. 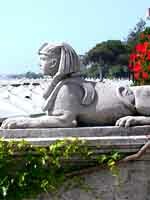 Also became a suburb of Venice, with many residents commuting daily to their jobs in Venice. 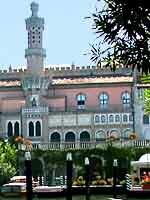 We left the vaporetto and walked the Gran Viale Santa Maria Elisabetta, past hotels, villas, shops, and gardens, crossing the island to face the Adriatic Sea. We turned right and continued our stroll on the Lungomare Guglielmo Marconi past the Grand Hotel des Bains (site of Mann's novel), the Casino, the Cinema Festival Palace, until we encountered the Grand Hotel Excelsior. 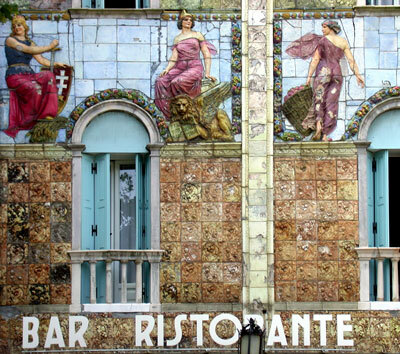 Weary of foot, we entered, ordered cappuccino, and sat on the veranda gazing at the sea. Later we walked out the long pier to the sea. The season hadn't yet begun, but the staff was preparing the hotel and beach for the onslaught of guests that would soon swoop in. Bulldozers groomed the beach and two workers struggled to move large boulders out the pier to the breakwaters. Would that I could afford to stay in a hotel of this quality whenever I travel. The staff and service were impeccable. 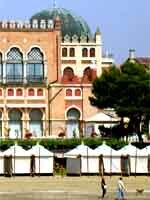 The rich and famous make the Excelsior their home of choice when visiting Venice, especially in August when the annual film festival takes place. Due to the heat and humidity, we chose not to walk the entire seven mile length of the island, instead returning to the main square through a shaded residential area. 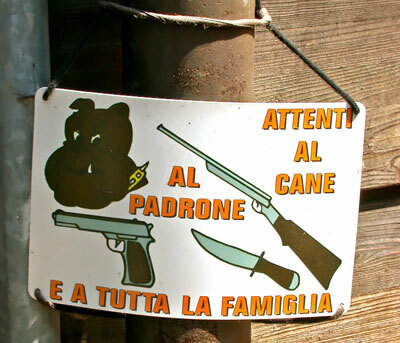 We passed local shops, construction workers wearing bikini bathing suits, yards with nasty dogs, and well-groomed gardens. 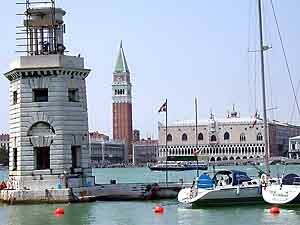 After lunch at Ristorante alla Botte, it was back onto a vaporetto to the island of San Giorgio Maggiore, which is in Saint Mark's Basin directly opposite the Doges Palace and Piazetta. 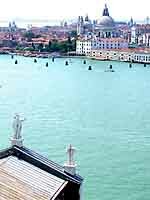 The Church of San Giorgio Maggiore is one of Venice's most prominent landmarks, if only because it appears in so many photos taken near St Mark's. Once on the island, however, I was struck by how quiet it is, how serene. 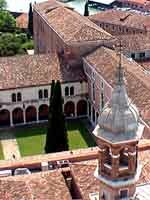 The church itself is quite striking, but a ride up the elevator to the top of the campanile provides one of the most beautiful views of Venice and the Lagoon to be seen from anywhere. The tourist turmoil of the Piazetta is close enough to be visible but far enough away as to seem another world. In all four directions, the view was spectacular. Far below, one can see the impeccable green cloisters of the adjacent monastery. The bells of the campanile ring at regular intervals, so we made sure to leave just before the 2:30 gong. It would have jarred the ear drums. On the ride down, an old monk who operated the elevator told us, in Italian, that he had never been out of Venice. For dinner, we tried to find Antiche Campane, a seafood restaurant recommended by friends. But we had not pinpointed it on the map before leaving the hotel, and directions we received in Italian from friendly locals were confusing. So we gave up and grabbed a panini (pressed sandwich) near the Scuola di San Rocco where we were to attend a concert of 18th Century Venetian concertos and arias, music by Vivaldi and Galuppi. The concert took place in the first floor hall but, at intermission, the audience was permitted to climb the great marble staircase to the upper hall. It is so magnificent that I enjoyed it as much tonight as I had two days ago. On our return to the hotel, the night clerk was ranting about blacks in Venice and hotels customers always wanting to use the computer. 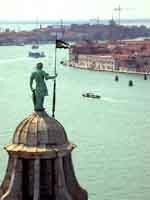 He complained that everything was so expensive that native Venetians like himself were forced to live on the mainland. Then blacks came in and made money. And now tourists were always wanting to use the public computer that the hotel has provided in the lobby. He was very upset. But why? Well, it turns out most of Venice was upset that day. 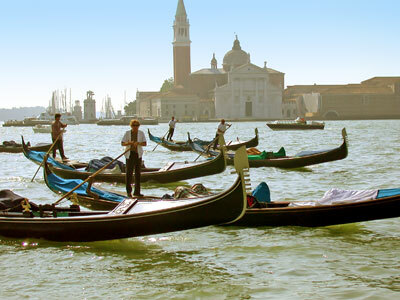 The gondoliers had gone on strike today and totally blocked the Grand Canal, shutting down all traffic. That's why we saw so many in the morning, they were on the way to their marshalling point. Because we spent all day at the Lido and Isola di San Giorgio Maggiore, we missed it all. But the gondoliers' strike made news the world over. They were protesting immigrants, mostly blacks, who sold fake designer purses in the streets. 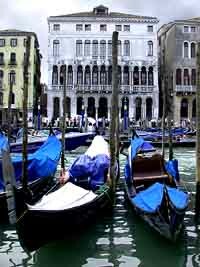 They would set out their wares on white sheets on streets, bridges, campos and near the lagoon, often between the gondolier stops and the tourists, effectively blocking the tourist off from the gondolas. This hurt the gondoliers' trade. And other merchants were upset because the street vendors didn't pay any of the permit fees and taxes that were required from all other merchants. It has been a touchy subject for quite a while and it all came to a head today. 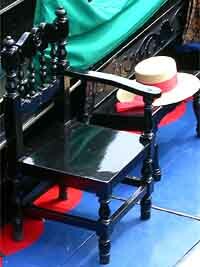 Tempers flared, the gondoliers blocked the canal, and the night clerk raged.